Darío Monasterio, analyst, questioned the data presented yesterday by President Evo Morales, when he argued that the average economic growth of the country has been 5, in the last decade. The expert, via phone call with El Diario, questioned data exposed by the President in his 10 years of management, because it only shows the country in terms of dollar figures. According to the statements of the interviewee, should take into account that international organizations reports reveal reductions in economic growth of the country and Latin America in general, this aspect is not taken into account by the Government, which currently holds a “worn out speech”. Monasterio also acknowledged that Bolivia has the largest South American economic growth, which also reflects the increase in the foreign debt, which was little exposed in the speech of the President. “The deficit of 4.5 per cent is a record in the country’s economy, because the real growth is 3 percent, which is supported by studies at the international level,” explained Monasterio. According to the analyst, you have to better manage the use of resources, since these must be invested in projects that have “strong impact”, thus not dependent on hydrocarbons, “this will help to better fight poverty”. On the other hand, Monasterio said that exports to a flexible exchange rate, should be encouraged without damaging the domestic consumption, since the current situation benefits neighbouring countries and increases the economic crisis of Bolivia, mainly affecting the economy of the population. The economist recommended to attract foreign investment by providing legal certainty, because the State cannot compete with private employers when it comes to produce resources little worked in the country. Also proposed private competition in the production of dairy products, poultry, agricultural, among others, because the Government makes is to create state-owned enterprises, which makes that the employer does not invest its capital. 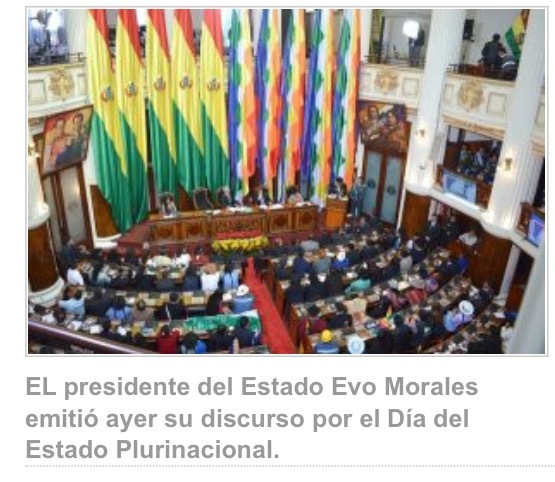 It should be noted that President Morales collated 20 years of neoliberal Governments against 10 years of its management yesterday and said that the country’s economy has grown on average 5% a year, over the last decade. In addition, he said that the gross domestic product (GDP) nominal rose 196%, reaching a total of 33,794 million dollars. Morales recalled that, between 1986 and 2005, the Bolivian economy grew only 3.2% and nominal GDP was 9,000 million dollars. “Growth of the real GDP, from 1986 to 2005, (in) average was 3.2%. In 10 years of management, (in) average was 5% economic growth. “The 2005 GDP was 9,000 million dollars, this year (2015) have risen little, but as we are over 33.794 million US dollar”, reported. On the other hand, he said that GDP per capita (per person) of the country rose in the last decade of $1,000, in 2005, to 3.119 dollars in 2015. Regarding the average inflation of the past 10 years, he explained that this figure reached 6.3%, while in the 20 years of “neoliberalism” reached 11.5%. Just remember that all those “great numbers” the coca grower leader acting as Bolivian president, came out as a result of the booming international prices of our export commodities, nothing else. As a true demagogue he portrays those high numbers to his government. Nothing further away from the truth, from reality. His only “achievement” is to have wasted over $150 billion dollars in the past decade! This entry was posted in Bolivia, Business, Economics, Politics, Social Unrest and tagged demagogue, democracy in peril, Ochlocracy, public policy failures. Bookmark the permalink.